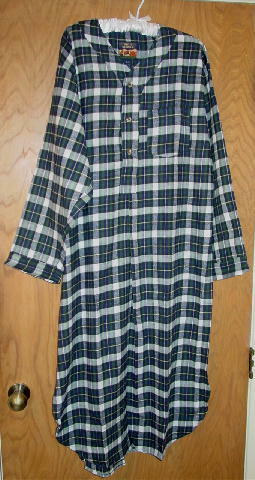 This never-worn (we took it out of its bag and unpinned it to photograph it) early 1990s men's flannel nightshirt is by High Sierra. 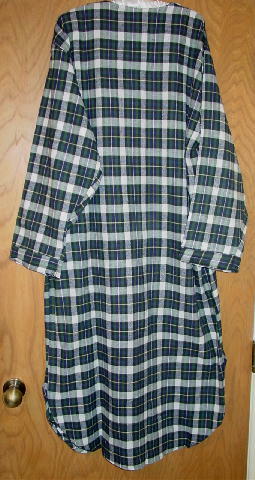 It has a three button placket and is mid calf in length. 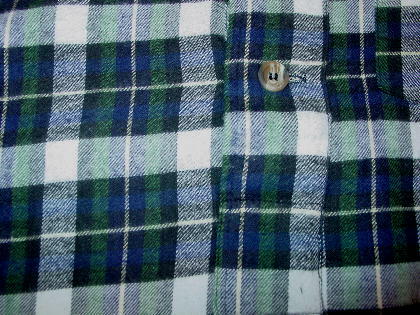 It's double-brushed 100% cotton yarn-dyed flannel (exclusive of trim) and has a plaid pattern in white, black, dark blue, and green. The bottom sides have 14" slits which are curved at the bottom. It has a 6" deep V neckline and a breast pocket.